Human resource department of the company mainly deals with all the responsibilities of the personnel and training strategy of the company. All the training and developing programs of the company has been conducted by this human resource department. The function of human resource management includes handling the working environment of the employees and their benefits details. Providing the resources and manpower development of the company are some other hr duties and responsibilities in a company. 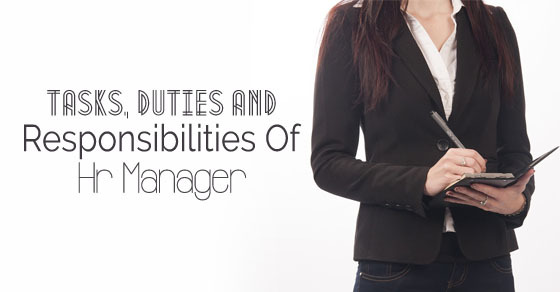 There are several types of duties of an HR manager in a company, for the overall development of the company. An HR manager job role handles all the employee training and employee working environment for the company. Human resources manager mainly manages all the activities like planning, updation and directing functions of a business/company. They basically act as a link between the employees and company management. It is the role & responsibility of the HR manager that all the human resource management functions of the company should be managed smoothly. The role of an HR manager of the company is the sole face of the human resource department. One of the common role and responsibilities of the HR manager is that he/she is the person who monitors the recruitment process of the company. The HR manager roles and responsibilities include hiring responsible employees and employers who can invest their skills and abilities in the overall development of the company. It is essential to have a knowledgeable and responsible HR manager because without resourceful manpower the company cannot move in the right direction of success. Roles and responsibilities of an HR manager in an organization is to build an organizational structure. The HR roles and responsibilities help in laying the foundation for the organization. They participate to form different pillars in an organization that is responsible for its development. They develop different strategies to meet the goals of the organization and contribute their support to all the departments of their company. They also acknowledge team leaders with their results VS actual and make them understand their target and how to achieve them. They take a different kind of models and survey them by implementing in the organization. They take care that each and every member is contributing to the organization. HR manager responsibilities and duties are to infuse the government’s HR policies in their organization’s HR policy and keep revising policies for the better performance of employees. One must be aware of all the government policies to reflect them in their policy. They keep track of whether the policies they implemented are working successfully and if not they take necessary action and inform their reporting executives to check out with their employees on this. It includes leaves, promotions, regulations, pay, incentives, abscond policy, working hours etc. It is a human resource manager’s key task to recognize their employees and reward them for their performance and contribution to the organization. They encourage employees to perform well. According to their grading or rating, they will collect the information from the department managers and recognize the employees as per their performance. They nominate some members to form a team for this employee reward and recognition. They make sure that this process underlies with organizational policies. Once the hiring process is done, the human resource management will take care of their training process. They prepare the program depending on the department and the nature of work and enhance the new hires by making them experience with the organization’s environment. They provide an opportunity for them to learn skills and develop in their career. They also conduct employee engagement program in which one can interact with their colleagues-employee. They do give training on awareness programs for women employees on how to protect themselves. The human resource team handles different elements in a company. The roles and responsibilities of the hr manager is to support and manage employees, employee facilities, issues, concern, feedback etc. They take care of employee salary, travel expenses, medical treatment. The hiring process, relieving process all these will be listed under HR tasks responsibilities or under duties of an hr manager. Here are the basic human resource (hr) department functions in general. Once the organization recruits new hires, they will provide an appointment letter with all the details. Collecting and maintaining records of the employees with all their personal and educational details in it. Assigning them with their reporting manager. Providing them with temporary access ID cards, IT facilities that are required for doing work, arranging them training, filing all the documents like their bio-data, date of interview, date of joining, completing all formalities and keeping them in records, providing them with insurance, professional fund schemes that are underlying with government rules. A training on basic safety and presentation on the company. Organizational structure, rules to be followed and taking care of their on-boarding process. They dedicate their existence by developing ideas to improve their company. They analyze the requirement of the company and arrange the employees and their skills that would contribute to growth. They develop the organization model right from the topmost leaders to the least level executive and form a chain how one interconnects with others in a hierarchy. They evaluate the results and start developing the employee knowledge for the success. They start organizing teams to work in a team and combine their results. They make sure that every leader is aware of their goals so that will help their peers focus towards the vision. They keep alarming all leaders about productivity. It is the roles and responsibilities of HR to take care of their employees, they will provide solutions to the employee issues. They take feedback regarding organization facilities which might be uncomfortable for them, the HR person will be ready to take up their issues to management and sort them out. The role of an hr department is to manage the benefits of employees and help them with their rights. It is their duty to make the employees aware of their responsibilities while working in a business environment, like how to keep the premises clean, about discipline, how to follow safety in the work environment so that they protect themselves and workforce environment. They help employees with attendance and login queries. Planning, HR expenses that spent for employee welfare and providing a budget to finance and accounting team. Developing programs for employee motivation and make them stress-free by arranging events and influence harmony between employees. Ensures organization announcements and communication is reached to every employee. Analyzing and implementing the organizational agenda and make sure it in practice. They take the survey on employee satisfaction and evaluate results and they communicate with employees and take feedback from them so that they get satisfied. They measure the employee performance and assign them with new roles and provide increment based on it. How to Become a Human Resources Manager? The human resource manager not only needs skills and abilities but there are also few other things which are very vital to become a HR manager. A bachelors degree in human resources or any other fields like finance, information technology, management or education. A master’s degree in human resource and an MBA can be even more beneficial. Though degrees and diplomas help you in acquiring the position but managing and handling the designation surely requires works experience. It is a well-known fact that managerial position requires good knowledge regarding, conflict management, employee engagement, employee management and also the laws regarding HR etc which all can be gained through experience only. Most of the companies when hiring professionals for such higher positions prefer certified people in order to hire the best for their organization. The HR manager when working for MNC’s also has to travel a lot, as their company branches will be located in different places. Even if their job roles do not differ but they need to look after a few factors that vary from one location to another. As per a survey, there are about 1,36,100 jobs approximately which are held by human resource managers. For better understanding, I have listed a few sectors along with the percentile of HR managers working under them. Duties and responsibility of the HR manager is not only to recruit employees but also contract employees. They develop HR Standard operating procedures also collect other department SOP’s and review them. Identify vacancies and also responsible for role rotation process. Prepare an organizational chart and implement it. They make sure equal opportunities are provided to each and every employee. Revise and update protocols. Employees expect an appraisal as per their performance and experience in the organization. HR is responsible for the appraisal process, they analyze their responsibilities and roles and criteria for the new role, conduct an interview and assign the new role. The HR team identifies the same employees eligible for the role and picks the best employee suitable for the role by communicating with the leaders. HR team appoints a team to coach the employees for the new role and make them aware of the job requirements and their role in the department. They ensure technical, diversity, experience, skills all these factors are fulfilled while giving the appraisal. They design the pay as per the new role by enhancing the current pay and provide them with the proper documents. HR also plays a key role in legal compliance. They adhere to the employment and labour laws, it is their responsibility that they are maintained with discipline without ignoring it. They build a structure as per the legal laws. They ensure the rights of employees are established in their organization. Also, they hire contract employees to take care of these responsibilities and they conduct audits at regular intervals for internal discipline. So that they avoid legal cases and maintain a record of legal laws to review and communicate to the organization. They are the point of contact to check whether all laws are protected and established in each and every department. A complete data of employee are stored in records with HR. In case of any issues, HR provides information of particular employees. Their salary data, personal data, roles played, loan data, medical claims are retrieved. This is utilized whenever the employee is transferred to another location or promoted to another or while providing loan facility, they check the employee history. They track the attendance as per their database and pay the employee accordingly. They assign training as per the data, HR will have detailed information about their training history and analyze new training that one needs for their growth. It will also be utilized during the employee exit process to make a full and final settlement of the employee. Human resources act as a backbone of any company, as a result, the roles and responsibilities that come along with it are many. For your easier understanding, the roles can be viewed in 2 ways. As mentioned above, the human resource responsibilities are many so there must be multiple people working in the HR department to manage all of them. Now if you would like to start your career in HR then here are a few roles you need to have an idea about. The average mean salary of a human resource manager lies between $106,910 to $193,550. Therefore, the bottom line is that the duties and responsibilities of hr manager is to update and review policies and generate protocols. They conduct meetings and inform about the revision of policies. They make sure every requirement is fulfilled to get a right award to the right person without ignoring any of the employee hard work. This builds a healthy relationship between employer and employees. Also training on team management, how one could be an active part of a team and deliver the best results for the organization/business. They also conduct surveys on several things to find the opinion of employees. Hence, above-mentioned information will help one person to know the actual job description of the HR manager.